Will Simpson - Click here for Will's bio and other video topics. Bernie Traurig - Click here for Bernie's bio and other video topics. Equine activities can be hazardous and may subject participants to injury. 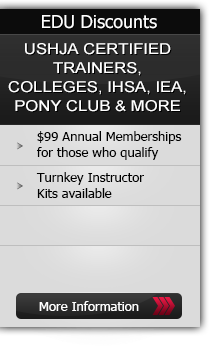 Neither Equestrian Coach, LLC, Bernie Traurig nor Will Simpson assume liability for your activities. This program provides general instructions and techniques that may not be suitable for everyone. No warranty is given regarding suitability of these instructions to the viewer. Equine activities can be hazardous and may subject participants to injury. Neither Equestrian Coach, LLC, Bernie Traurig nor John French assume liability for your activities. This program provides general instructions and techniques that may not be suitable for everyone. No warranty is given regarding suitability of these instructions to the viewer.